I agree with Committee's recommendation, including the words "white supremacy." It's historically accurate. Let's speak the truth, "warts and all." Let's continue promoting healing and brotherhood in our Nation's Oldest City. The St. Augustine Confederate Monument Contextualization Committee text is truthful. I have never been prouder to live in St. Augustine. differing views of my friend, Melinda Rakoncay. Corrected 7/8 to reflect there were ten (10) meetings commencing on February 7, 2018. 1. I was the only citizen who attended every meeting, gavel-to-gavel, from February 7 to June 20, 2018 (other than Committee members and City staff, of course). 2. I agree with the text recommended by our Confederate Monument Contextualization Advisory Committee. 3. The Committee, assisted by City staff, thoughtfully researched, analyzed, discussed, debated and understood our history. This is the first "biracial" committee in City history. 4. The "white supremacy" statement is no "affront," as one person asserts -- it is historically accurate. (Compare differing views from Ms. Rakoncay, attached). 5. Thank you for preserving and contextualizing St. Augustine's Confederate Monument. Thank you for resisting threats and pressures to remove or demolish it. 6. Thank you for telling the truth, the whole truth and nothing but the truth. 7. As Presidents Abraham Lincoln and George H.W. Bush would both say, "Here we stand, warts and all." 8. Keep up the great work! The University of Florida and other cities are watching what we do. 9. I have never been prouder to live in St. Augustine, Florida. 10. Be not afraid. Let the process of healing continue. Encourage continued rational discussion of an emotionally-charged issue. 11. Listen to everyone, learn from everyone, promote healing, but never back down from historical truth-telling. 12. Mayor, City Commissioners, IF you have not already done so, will you please watch some (or all) of the ten (10) meeting videos this weekend, so as to appreciate better your diverse, highly-qualified, well-informed Confederate Monument Contextualization Advisory Committee's scholarly, reasoned, documented deliberations? As President Lyndon Johnson told Congress after Selma, "We SHALL overcome!" The Confederate Memorial Contextualization Advisory Committee recommendation is to add a plaque to each four sides of the memorial that would provide brief details about the monument, about St. Augustine during the Civil War and the Emancipation Proclamation, about men from the city fighting on both sides of the war, and about how the monument is perceived differently by people. Below is the proposed wording for each of the plaques. FREEDOM: Our nation’s Civil War was fought from 1861 to 1865 between the Confederate States of America and the United States of America. Battles did not come to St. Augustine, but Union troops occupied the city in March 1862. They remained through the end of the war and Reconstruction. President Abraham Lincoln’s Emancipation Proclamation decreed that on January 1, 1863, “all persons held as slaves within any State ... in rebellion against the United States, shall be then, thenceforward, and forever free.” The Proclamation formalized the freedoms that enslaved people had claimed for themselves since the arrival of Union troops. On New Year’s Day, 1864, the Proclamation’s first anniversary was celebrated in this Plaza, where the Confederate Monument would later stand. The Emancipation Proclamation and the 13th, 14th, and 15th amendments to the U.S. Constitution brought new possibilities to St. Augustine’s black residents earlier than other areas of the Confederacy: to own property, to marry legally, to learn to read and write, and for men, to vote and hold public office. SACRIFICE: White men in St. Augustine formed militias which joined the Confederate Florida regiments and fought in Tennessee, Kentucky, Pennsylvania, Virginia, and North Carolina. Only a handful remained to surrender in 1865. Many others were buried in graves far from home. Black men in St. Augustine were among the first to join black fighting units in the Civil War as early as 1862. Local black men headed to Hilton Head, South Carolina, to join volunteer regiments. These forces were later designated the United States Colored Troops (USCT). The USCT fought in segregated units led by white officers. They raided coastal areas, liberated thousands of enslaved persons, and in 1863 the Colored Troops led the way in occupying Jacksonville, Florida, and in 1865 restored the Stars and Stripes to Fort Sumter, South Carolina, where the war began. MEMORY: This 1879 obelisk replaces one originally built on South St. George Street in 1872. It is the second oldest Confederate monument in the state of Florida. 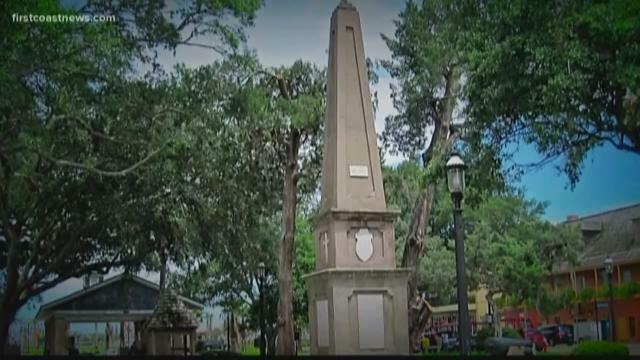 The Ladies Memorial Association of St. Augustine raised private funds to construct the memorial to honor the town’s men who died in service of the Confederate States of America. Its marble plaques were once attached to the 1872 Confederate memorial. The plaques list the names of forty-six men, many of whom were of Minorcan or Spanish descent, a reflection of St. Augustine’s diverse ethnic heritage. For many years on Confederate Memorial Day, April 26th, the ladies of the Memorial Association decorated the monument with flowers. As decades passed, the memorial blended into the Plaza’s landscape. The City of St. Augustine respects the historical and emotional importance of this memorial. INTERPRET: The public’s response to the display of Confederate monuments from the 1870s through the Civil Rights era and beyond remains deeply personal, emotional, and divisive. Some view this memorial as a noble reminder of personal sacrifice; others interpret it as a painful reminder of the re-assertion of white supremacy. Why are monuments and memorials important? They convey what a community feels and honors, and reflect the values of its people. Monuments and memorials reflect the social and political context of their time. Those perspectives and interpretations change over time, and this monument is no exception. The obelisk honors local loved ones who gave up their lives in service of the Confederate states. Yet in all these Confederate state constitutions, black people were legally regarded as human property. This memorial is a reminder of the diverse legacies of the Civil War. meetings, and can attest that the committee did not have an easy job. here, and to the memory of families whose relatives are on the war memorial. on the plaza. The City Commission voted to keep it with a contextualization plaque because St. While it might have been well intentioned to try and explain the complicated and unique role of St.
woven unintentionally into the wording, and no one will ever be happy with the final content. men on the memorial, but two paragraphs are given to Union black troops and their accomplishments. CSA markers in San Lorenzo Cemetery. different, and should be respected as such. However, I understand the political need for the City to do something regarding this memorial. because it is a war memorial and is very much part of our Plaza history. Association of St. Augustine to commemorate local men who died in service to the Confederate States of America. dead rest in peace. This memorial has quietly been a part of the Plaza’s history for almost 140 years. Now is not the time to change the memorial or its history.